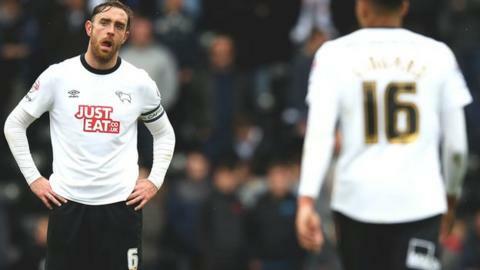 Defender Richard Keogh says he can hold his head high following his three-year spell as Derby County captain. Rams head coach Paul Clement decided to give the captain's armband to Chris Baird at the start of the season. Keogh told BBC Radio Derby: "I'm very proud of what I've done in three years of being captain of this football club. "We achieved a lot in those three years. We couldn't get over the line but I am very confident we can do it this season." Keogh, 29, led Derby into the Championship play-offs two seasons ago and was in the side which suffered last-minute heartbreak, as Bobby Zamora's last-minute goal sent Queens Park Rangers into the Premier League. The defender has received criticism from a section of the club's fans in recent times and he believes some of it is unfair. "When you are captain, and the figurehead of everything, it comes with the territory and people look for someone to blame and maybe it was a follow-on from Wembley a bit," Keogh continued. "The fans are passionate and they are entitled to their opinion and they all want the club to do well. I didn't think some of the criticism was fair but we move on. "I'll carry on doing what I always do and pass advice on to younger players and set higher standards for myself on the pitch. "Getting voted in the Championship team of the year last year says a lot but it probably went unnoticed. I missed one game last year, so I like to think my performance levels have been quite high."